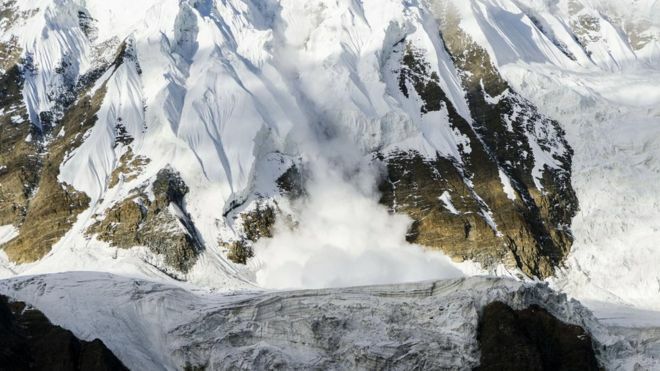 Nine climbers are feared dead after a violent snowstorm destroyed their camp on a Himalayan peak in western Nepal. A five-member South Korean expedition team and four Nepali guides were at the base camp of Mount Gurja when the storm struck, police said on Saturday. A rescue helicopter at the scene confirmed seeing eight bodies in the ruins of the camp, but was unable to stay due to bad conditions. A ninth climber has yet to be found. Expedition organisers raised the alarm after losing contact with the group, who set off on 7 October, for nearly 24 hours. A police rescue team is currently making its way on foot to the site while the helicopter team hopes to return to the camp on Sunday, if weather conditions improve. The base camp, which is at least one-day trek's from the nearest village, is at 3,500m (11,483ft), on the 7,193m-high mountain. Mount Gurja sits in Nepal's Annapurna region, next to avalanche-prone Dhaulagiri, the world's seventh highest mountain.